WR Darrius Heyward-Bey finally appeared to living up to the billing in 2011, but then had a stupid DUI arrest just the other day that is going to cloud his offseason. 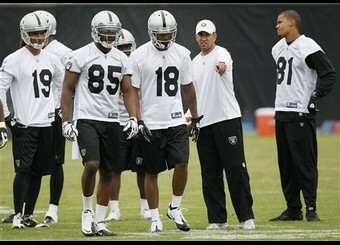 Heyward-Bey cleared the air on Tuesday, sending out a message to the Raiders and their fans at Raiders OTAs. Hmm…”kind of”? Little advice to Darrius – bite the bullet and be a man, and say that your sorry for the negative vibes you brought to the team. Heyward-Bey will plead not guilty once he appears in court, but that’s no excuse for saying he “kind of” regrets the attention the arrest brought to him and the Raiders. That was an affectation, Matt. I think you are being a little too hard on him. That being said, once a person has an arrest for DUI it increases the probability that that person has a chemical dependency problem. What is ANY pro athlete doing drinking AT ALL, especially this time of year. Players need to join the 21st century when it comes to their health, nutrition and how that effects their performance. Hello?? !